The Tulsa Youth Rowing Association is looking for 8th grade and high school aged athletes to join their competitive high school program. The program is offering a basic training program for beginners to the sport from August 25th to September 5th. There is a $30 registration fee for the two weeks of instruction and participants are under no obligation to join the program at the end of the two weeks. Participants in the basic training will learn rowing technique, boat handling and safety aspects to the sport. Interested participants can register for the training online at this link or contact Head Coach Neil Bergenroth at coachb@okrowing.org. The basic training will be held in the three locations: for details on locations click here (see bottom of page). 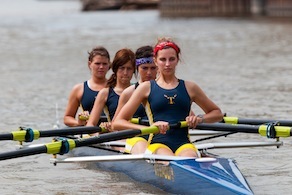 3) The TU boathouse located in Catoosa, OK.
More details on the training will be emailed out closer to the start date. The club had a very successful rowing season last year and has grown to sixty members in a short period of time. This past summer over thirty student athletes tried to the sport for the first time. The team regularly competes on the national level and our athletes are also successful in gaining college scholarships at universities all over the US. The essence of rowing is hard work. Parents that are looking for a sport for their children that instills some of the most valuable qualities and hardest to learn for their kids, should look no further than rowing. These include the capacity for unrelenting, hard work in a teamwork environment, and the concepts and merits that are involved in that, including commitment, sacrifice, bravery and selflessness. For online sign-up to the training please visit this link or contact Head Coach Neil Bergenroth at coachb@okrowing.org.